Sachin, Suraj and Nishant are stuck in thirty-fifth century BC due to a very stupid act. Now they are in the region of Angasak dynasty. Nishant remembers some cruel things associated with the history of two dynasties that are fighting for glory. Now they are running to help themselves. The reach takes them to the royal rooms where they are all set to move ahead. Will there quest end on a delightful note? What will happen when the rage of the other ruler is showered? When will they finally reach their home? The title and cover went hand in hand. They both suited the tale well. “History Revisited” the name says a lot and opens another level of curiosity. Also, the man on the cover, the hue of glory escaping from the sword comprises of essential information which works tremendously. The cover is a perfect analogy for a sci-fi fictional tale. Many people in the novel are from the ancient era and thus the sheen of royalty can be seen in the setting of the background. The main people of any dynasty are the soldiers and the people of royal blood. History Revisited has both the elements in abundance. Also the characters have very different characteristics and no two people are alike. The two rival rulers, their fighting techniques, their strength and extra powers are shown with excellence. The characters which shadowed the others are- Nishant (the narrator) and Princess Samriddhi. From the supporting or minor characters I loved- Ajay and Ananya. First person narration couldn’t bring in front the whole aura of magnificence. I feel that whenever a group of people are moving ahead in the story then we need more openness for all the characters. In the chapter “The Library” I felt this the most because at one place where Nishant was busy in exploration, Suraj and Sachin, his other two companions were lost somewhere, though they were playing a very important role there. I felt the author worked according to his ease, or maybe he wanted to keep the narrator up always, which didn’t work. 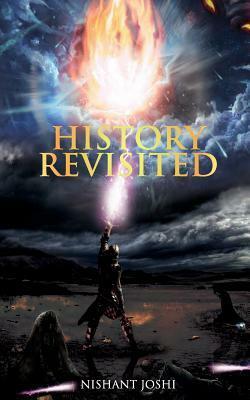 History Revisited has came out as a surprise package for me. I never expected to read something of this level. Well, at first I thought that the tale would be heard but nothing of that sort happened. The book has elements of magic, bravery, love, war and an everlasting friendship. The combination was great and it opened new era for me to enter. The start of the book was fine, I was enjoying it too but then came that one phase when I started getting involved in the book a lot more then what happened earlier. So, I must mention that the author has played his cards well in the middle and also in the end but he didn’t play well with the starting. All this I felt only after reading the middle portion. The biggest chapters were responsible for holding the book and also for my reviews. I enjoyed the phase when the three protagonists were stuck in the big library. It gave me a feel of shock and enjoyment at the same time. Same type of enjoyment I felt when I first saw Harry potter finding about Nicholas Flamel in the library. I was fascinated with both the library scenes. I am not at all judging or equating the two books. I am just trying to match the level of excitement the hunt in the library creates in me. The bo-staff, the swords, the balls, the hasth yantra, all made me ecstatic. The lights, the powers and all the magic tricks that were performed held me captive to the core. Further there is a legendary fight scene and it needs to be the best. And same happened here. The fight scene was well crafted. But I felt that all was left on one person and thus the essence of a brutal war was somehow suppressed. I never need a hero to rule, I need a clan to win. Ajay was mind-blowing with his tricks and the credit goes to the author for thinking such out of the box aspects. Summing up- The book was a surprise package, containing a story worth narrating to any kid. It had flaws and also worthy things. The sci-fi factor which the author wanted to bring, came up as the vital element and the whole book was standing erect only because of these images which he produced through his words. The book was a perfect break from romances and thrillers. What I loved about the book was the background. Set in 4000 B.C the story has all the elements of a basic and root level sci-fi novel. The elements used to show the witchcraft practices, all the instruments, the associated rage were really a great turn on. There were editing errors which hindered the smoothness. Also I felt the initial chapters could have matched the excitement of the latter ones. The writing was not as excellent as the story line. The dialogues were used very casually and they lacked the power to sway a being. Missing a sci-fi novel with touch of Indian roots, History Revisited can be your partner for this adventure. You can pick the book for a light and easy read. The author has grown up in an era that was full of science fiction elements be it television cartoons like Shaktiman and dragon ball Z, films like Spiderman and star wars or the never ending list of science fiction computer games. He set out his journey to pen down sci-fi novels since our country is void of it. Thanks Jasleen for the awesome review. Your words have inspired me a lot and I will soon come up with an even better story.